It looks like Xbox 360 owners won’t be the only ones having fun this summer, as Sony just launched their own summer release specials with PSN Play. Building on the success of the brief PSN Summer Sale we saw last month and inspired by the incredible feedback that Microsoft received for their Summer of Arcade this year, Sony has decided it’s time to hop onto the real summer deal bandwagon. According to sources, PSN Play will begin in the middle of August and last until the middle of September, offering four titles that will be released during that time with the possibility of owning a fifth for free. Players who are 18 or older will and who purchase all four of these titles will receive a special code which will allow them to download “Payday: The Heist” for free once it is release in the Fall. 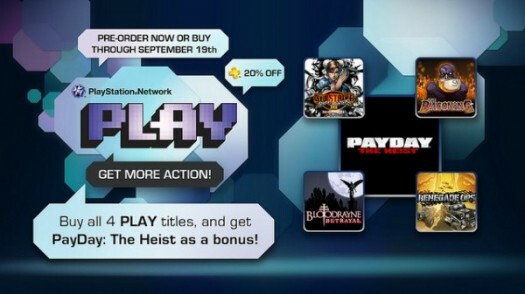 As well, players who are PlayStation Plus members will be eligible for a 20% discount on each of these titles, and any players who pre-order one of these titles will be rewarded with dashboard themes. Sony has also promised that there will be future DLC for each of these titles at some point, though no word on what to expect either cost or content wise. Time to start making Xbox 360 owners jealous, and enjoy some great downloading titles and gaming just in time for the next semester. Be sure to also check out some of the hot new releases coming out over the PSN this August.